Mandarin hovering near the furry mushrooms seeking small zooplankton. It is up long before the lights are on. Occasionally it is sidetracked by its reflection and displays furiously. Close-up of the nuisance brown algae in Reef B.
Pocillopora and 2 frags of spaghetti leather in Reef B. 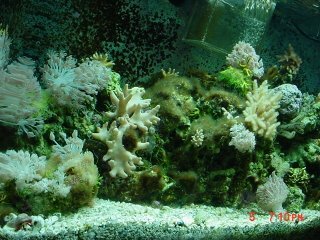 This is Reef B up for about three months. A large portion of this scene is taken up by a fuzzy brown algae that nothing seems to eat. Testing recently showed a pH of 8.0, alk 3.5, temp. 79.8, Ca 420, sp. grav. 1.025. 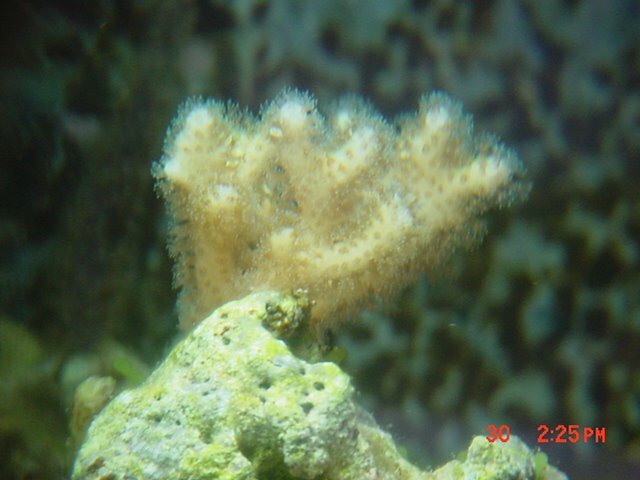 This is a frag of a Acro for which I traded a frag of Montipora digitata . 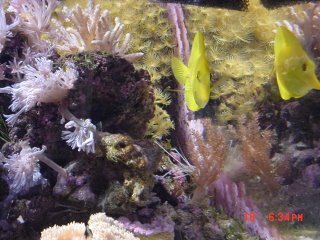 It is about as high in reef B as it can be. Another out-of-focus shot! 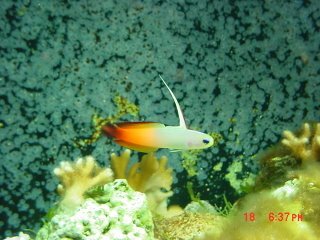 This Bicolor blennie is new to Reef B. After about a week it has become much more comfortable. 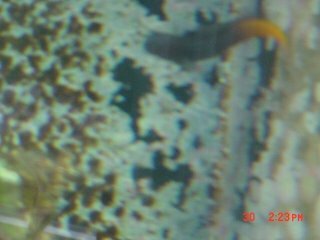 It bites at the brown algae but does not seem to be making much of an impact - at least not yet. 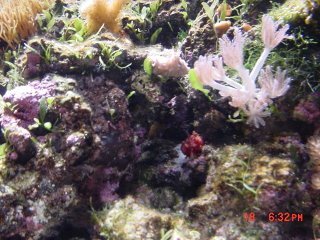 One of 6 Scarlet hermits in Reef B. The hope is that they would make an impact on the brown algae. 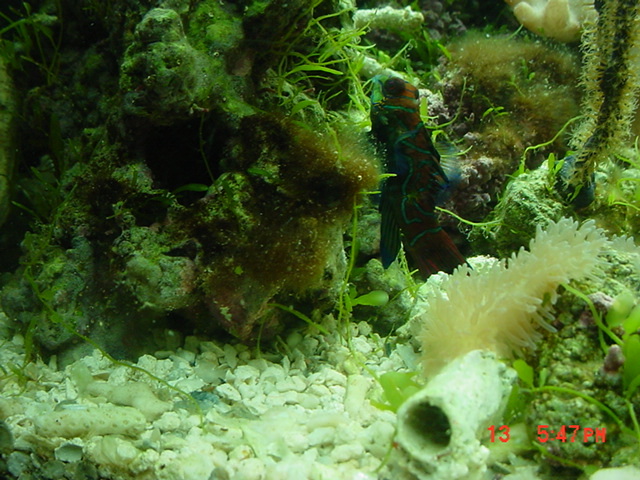 Two Peppermint shrimp were added at the time but have not been seen since intro. Sometimes there is some concern that there is some contaminant (eg. Copper) that new critters are unable to resist. 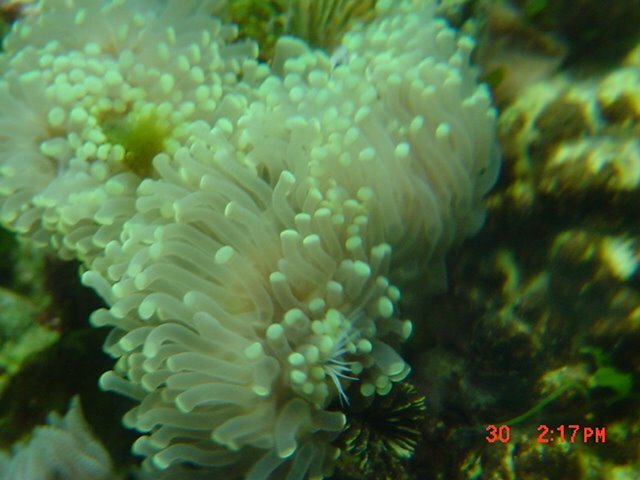 However, there are 3-4 species of hermits and numerous amphipods. A 10-gal water change is scheduled. 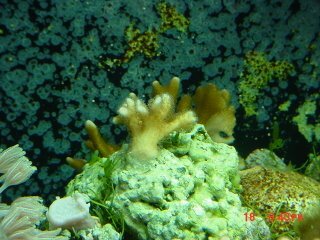 A phosphate, heavy metals sponge will be placed in the sump for a couple of weeks. Incidentally a Nitrate test today came up with 0 nitrate. 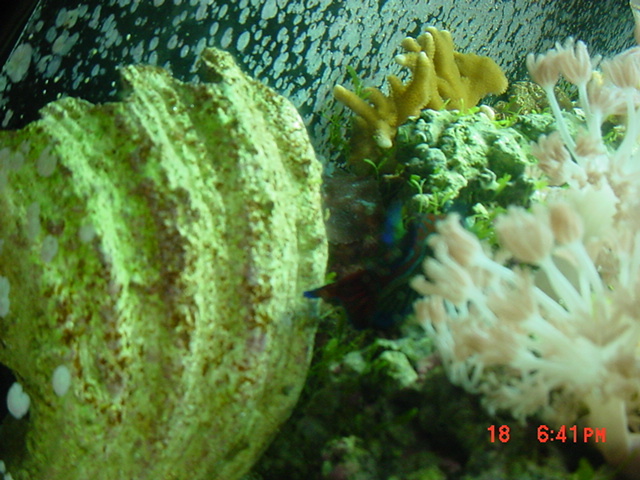 Anew Rainfordi in Reef B. It was very difficult to get his picture thus the out-of-focus shot. 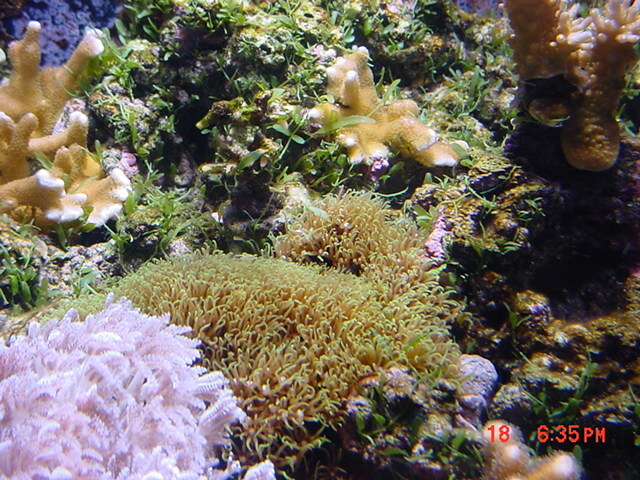 The torch coral in the newer reef (Now known as Reef B). The year-old reef. In the far corner is the mother Taro tree coral. 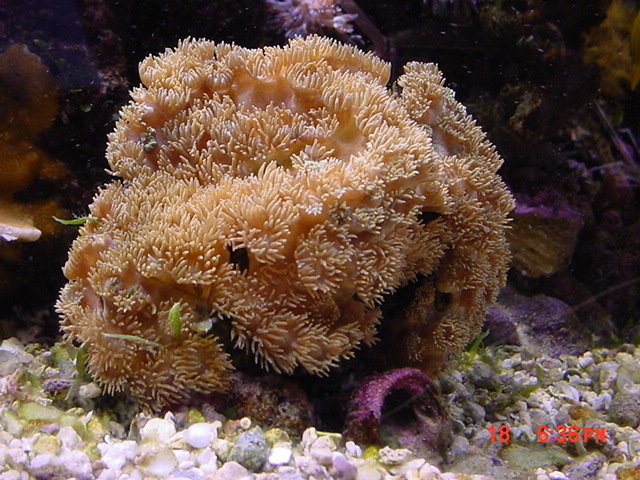 This shot shows how extensive the Pom Pon Xenia has become. Remember to click on the photos to make them enlarge. In the center is a small frag of Chili leather glued here about 3 days ago. 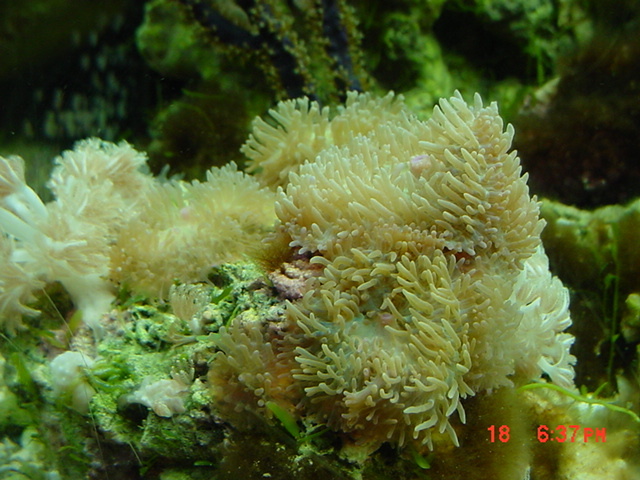 Barely visible are some extended polyps. 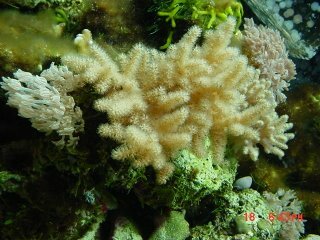 The large Pocillopora is the mother colony of all the others in this tank and the newer tank also. Two frags were recently donated to the Hatfield Marine Science Center. The Xenia in the lower right corner is several colonies that have gone through 4 0r 5 cuttings. 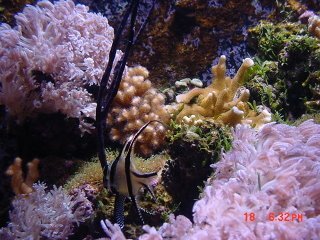 The Banggai is about a year in this system. 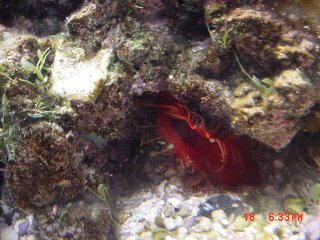 This Flame Scallop has been in this same spot for over a year. There was another one but it hid deep in the live rock an is suspected of being deceased. 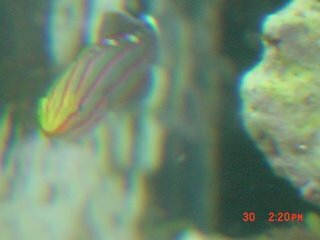 It is rare to get one to live this long in captivity. 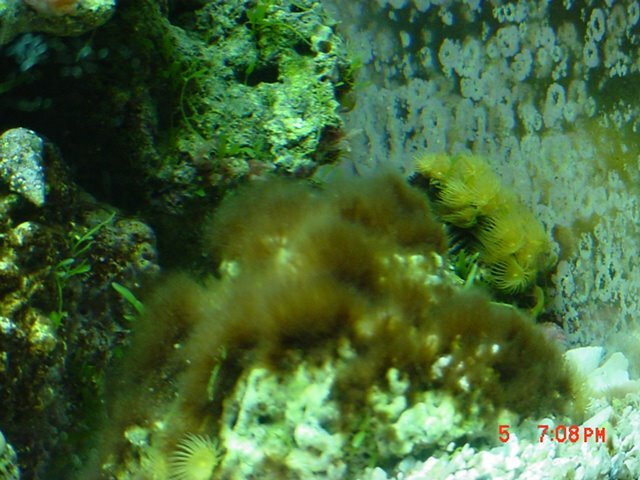 The Yellow and Brown polyps continue to spread having started over a year ago with only 10-12 polyps each. 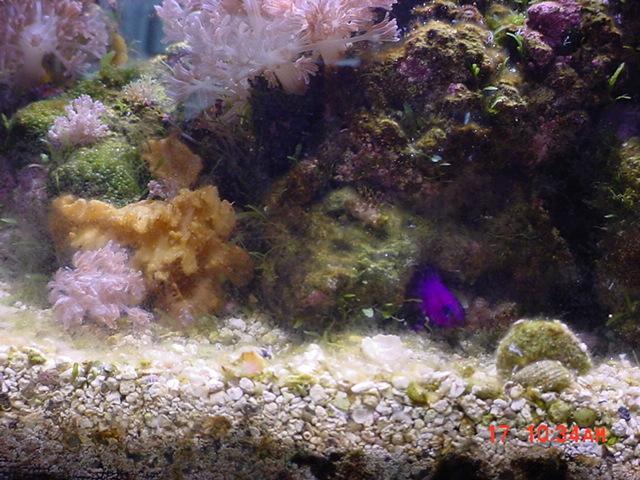 The Sinularia has been cut a few times and moved to the other tank. 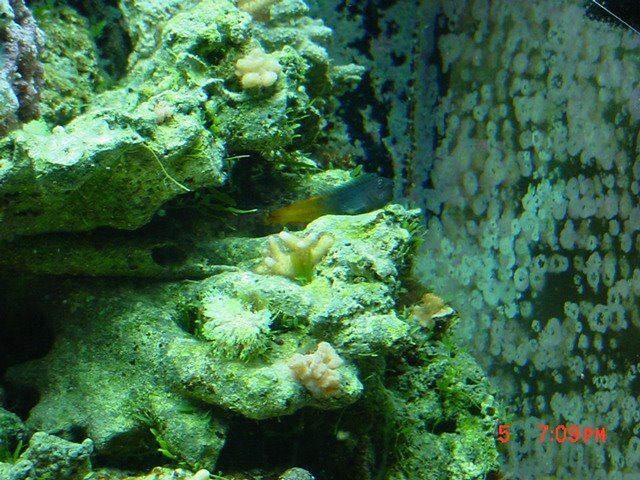 The Montipora on the left was placed there about a year ago. 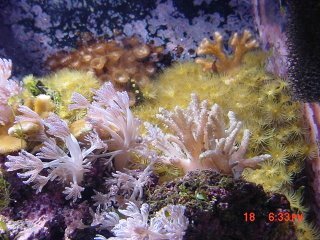 This tank has several colonies of this coral, probably the fastest growing SPS known to reefers. The Yellow Tang and its reflection which annoys it a great deal. 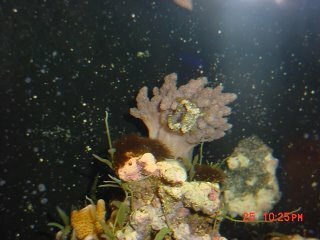 Below is a frag from the Taro Tree Coral just crammed into a hole in the live rock. It is a very rapid grower. 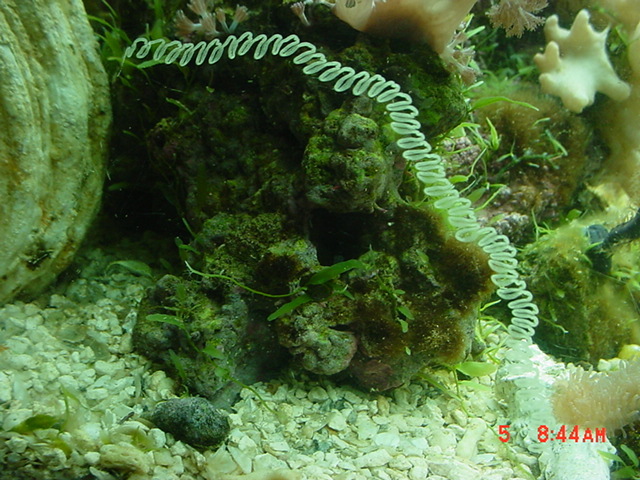 It can grow from pieces less than a cm long. 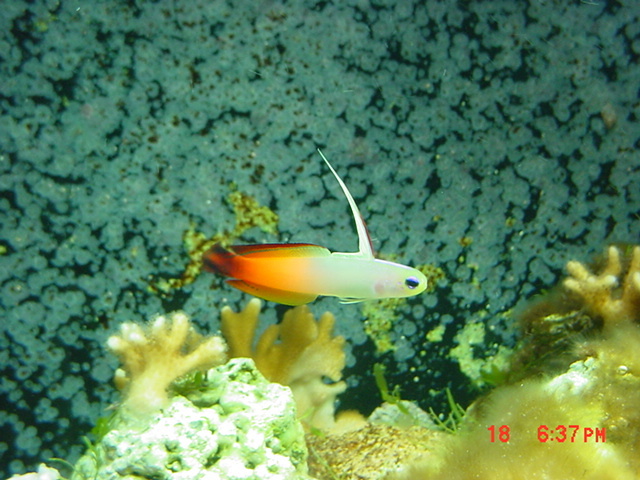 In the center is a M. capricornis recently detached from its plug and glued in this spot. With a magnifying glass one can see real small bright orange polyps. This Star Polyps has spread to three other rocks and continues to do so at a rapid rate. 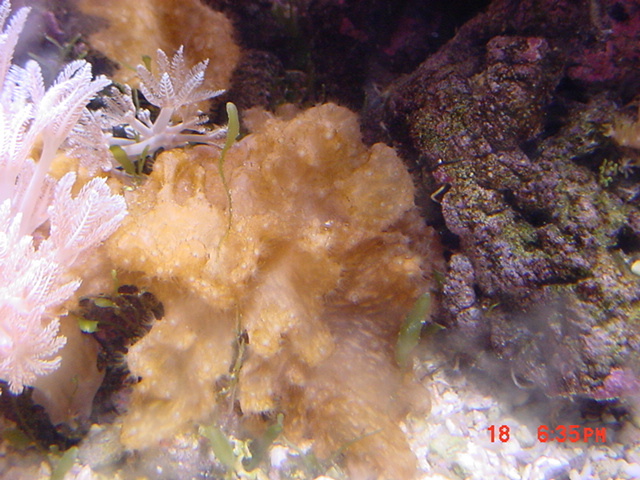 A Cabbage Leather recuperating from recent cutting for frags in the new tank. The Pagoda coral from the older reef. Furry mushrooms were moved from the older reef to under PC lighting (and away from the pesky Clownfish) where it appears to be recovering from the abuse they had suffered. 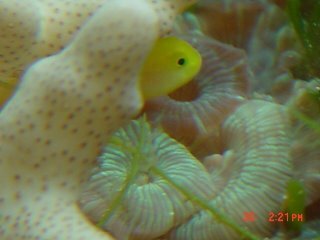 One of the only 2 fishes in the newer reef. 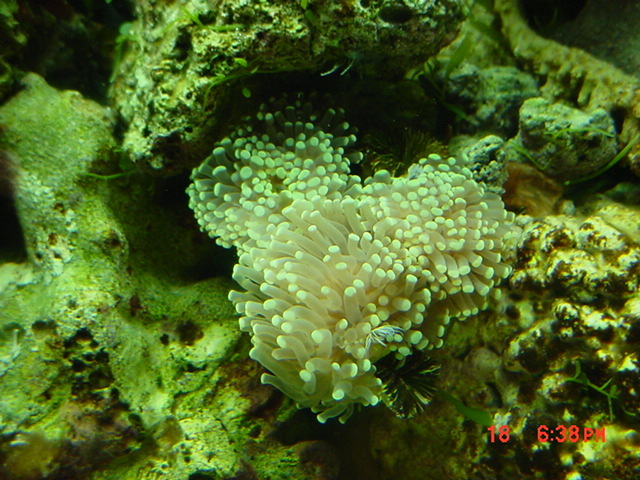 The Torch Coral fully extended. Two polyps receded prior to being moved to this tank. It appears to be doing better under the PC lighting than the MH. 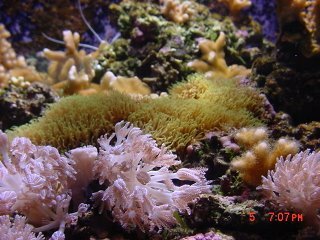 The current in this tank is stronger which is supposed to be something this coral does not prefer. A close-up of the finger-leather showing considerable rehab since the tank was set-up the end of December '06. In the foreground is a ribbon gorgonian. In the center (slightly out of focus) is the largest colony of encrusting gorgonian, And of course the ever-present Xenia. This is a close-up of one of the three Pocillopora frags in the newer reef. 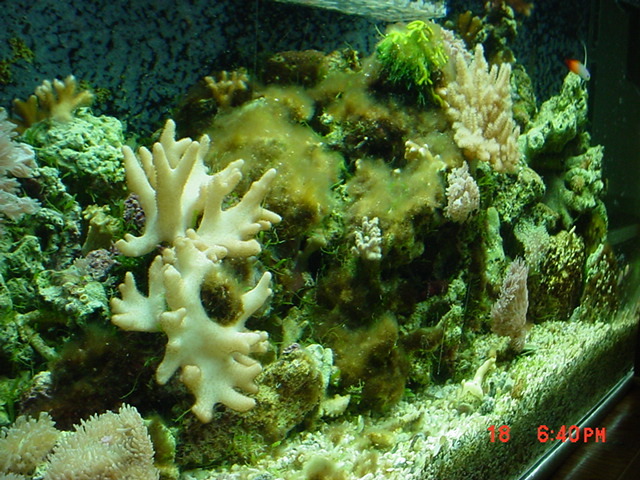 Overall view of newer reef. two coral frags on the upper left are Pocillopora crassicornis (SP) from the other reef. They appear to be growing. The lighting is 4X55wt 10K K PC lights on 10 hours/day. 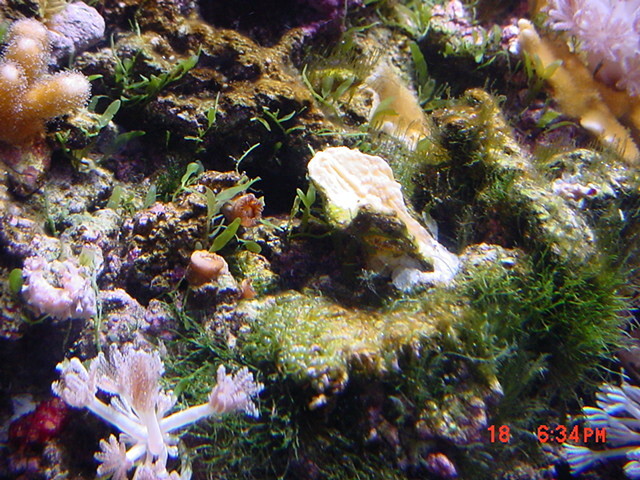 Upper center: a Montipora digitata from the year old reef. In the middle is a frag of Yellow Porites. It is often open but has not shown any growth in the past 6 weeks. 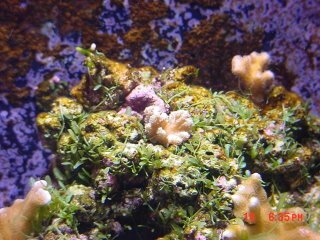 Photo from newer 50 gal reef of Xenia and Taro Tree Coral. 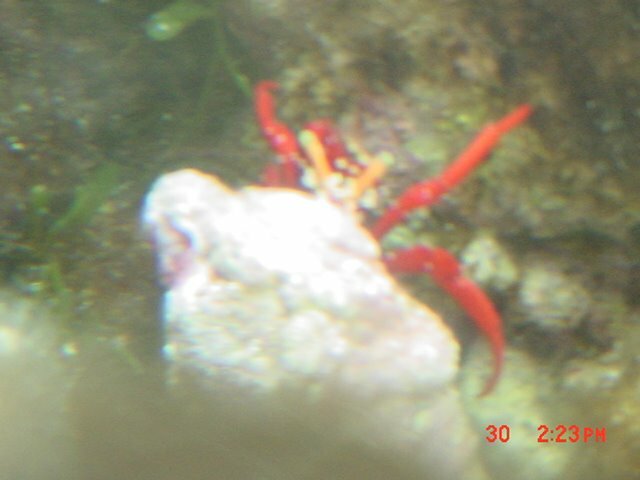 This crab is releasing its larvae at the highest point she could find after the lights had gone out. Shots of old reef showing new Royal Gramma. It came in last week and was presumed dead as it had stayed hidden until yesterday. It appears to be healthy. It is eating but very easily spooked at this time. The picture is a little dark. This Green Mandarin was added yesterday. 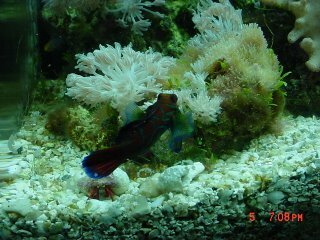 I rec'd it plus 2 Firefish, A Royal Gramma and a Cleaner shrimp from Coralsplus. I had paid for a Anemone crab but it was not in the shipment. At this point it appears that only the Mandarin survived. They came in very cold and hardly moving. This was the third time I had a shipment from them that was incomplete. Before this I had orderred Neon gobies and for the second time rec'd Engineer gobies DOA. I had orderred Scarlet hermits and got Blue leg and Mexican hermits. Half the shells were empty. Conclusion: I will not order from them again. 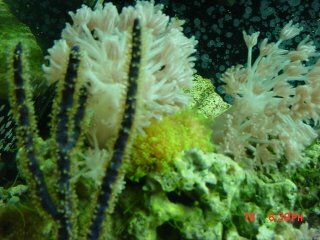 Good prices are hardly good prices when you do not get what you ask for!!! Later a refund was made for the last shipment. 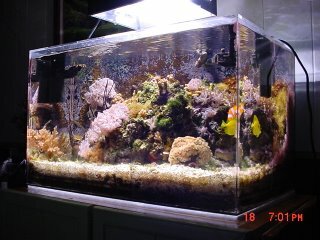 Photo taken on left side of new tank. 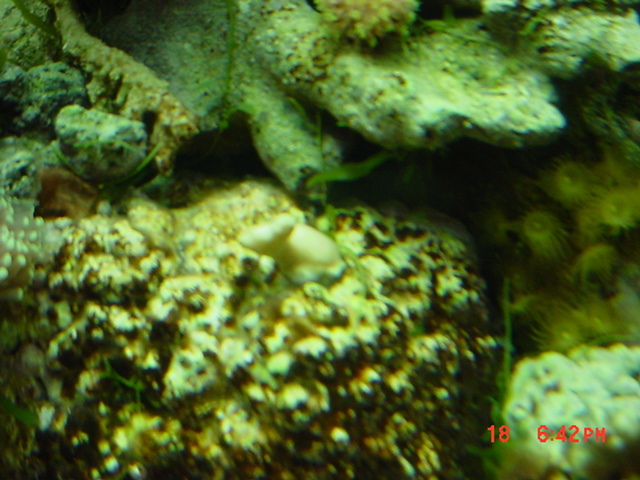 Appears to be a strand of eggs from a Cerith snail. 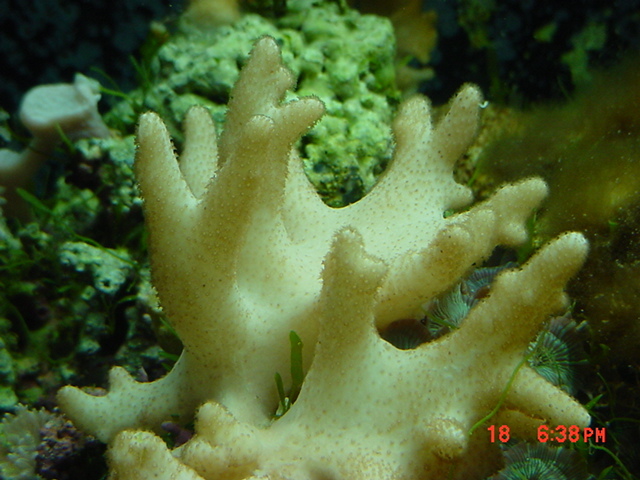 Under 30X magnification hundreds of eggs can be seen. 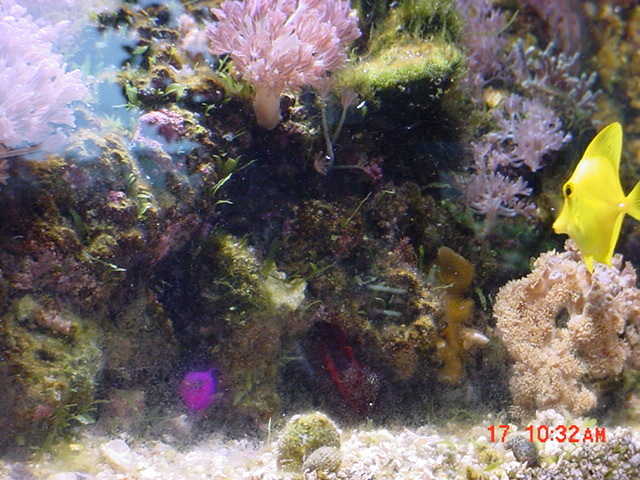 In the same area are several gravid copepods.